It is estimated that nearly 70 percent of people between 35 and 44 years of age are missing at least one adult tooth due to decay, accident, or periodontal disease. After 75 years of age, approximately one in four adults have lost most of his or her teeth. At John L. Aurelia, DDS, PLLC, in Rochester Hills, MI, we understand that healthy and attractive teeth are not only important for a patient’s confidence and self-esteem, but also are critical for proper nutrition, clear and effective speech, and long-term oral health and well-being. 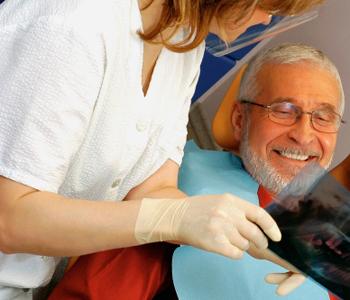 Today, there are several options for patients who are experiencing tooth loss, including partial or full dentures, bridges, and dental implants. While only about 10 percent of dentists in the United States perform dental implant surgery, the procedure has become the most recommended treatment for permanent restoration. Nearly half a million implants are placed each year, with few complications and limited risks. The average success rate for permanent tooth replacement with an implant-support crown is over 95 percent. Dr. John Aurelia is a Rochester native and an experienced Doctor of Dental Surgery who has served patients and their families from Rochester Hills, Troy, Shelby Township, and surrounding areas for decades. He has completed extensive training in advanced dentistry procedures, including dental implants. During dental implant surgery, a small but sturdy post, typically made from biocompatible titanium, is inserted into the bone of the jaw. The best candidates for implants have sufficient bone to hold the prosthetic root. The bone fuses naturally and securely around the post. Because a dental implant actually replaces the root of the tooth as well as the visible portion, the jawbone is strengthened and surrounding teeth are kept in position. Once the post has bonded with the bone, an extension is added and topped with a natural-looking, porcelain dental crown. For more information about dental implants, contact our professional team at John L. Aurelia, DDS, today at (248) 651-6810. Visit our patient testimonials, reviews, and smile gallery to see real results.